Morocco’s “Red Hamra” city of Marrakech is an icon for travelers to Morocco. A visit to this North African country’s hotspot of Marrakech is a must. Morocco is exotic and the penchant of every travelers dream is to visit Marrakech. 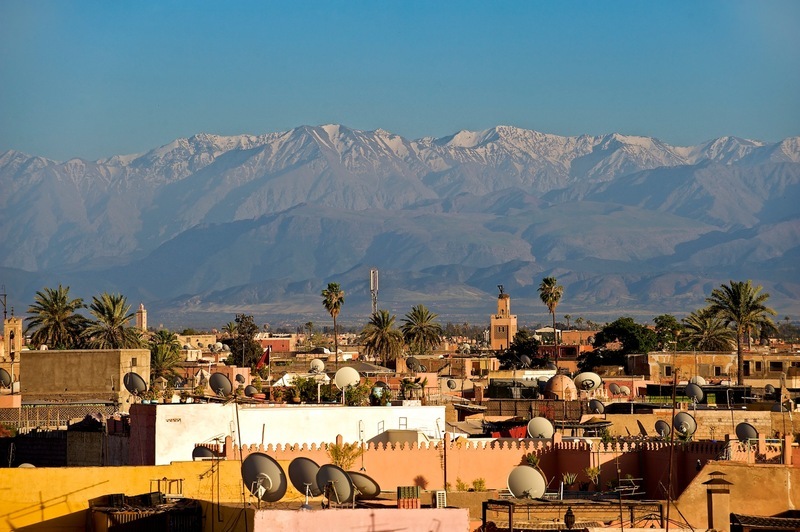 Marrakech offers landscapes to indulge in along with a bustling medinas and Berber villages just minutes outside. Here are Ten Great things to do in Marrakech. 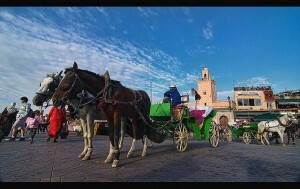 Take a romantic trip round Marrakech’s ancient ramparts in a horse drawn caleche . 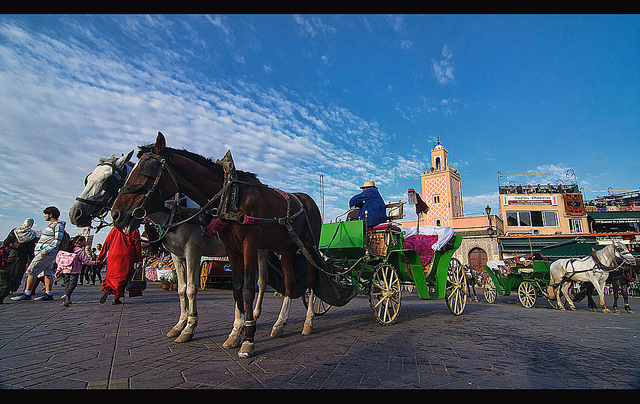 It is also an excellent way to get to know the city at a sedate pace instead of roaring around in a taxi. Make sure you agree the price before hand ! The fabled souks of Marrakech are a vibrant riot of colour as they display their riches crafted by its artisans , carpets, kelims jewelry, jellabas and caftans, dressess ,shirts and tunics,wooden bowls, ornate boxes and chess sets an, leather bags and jackets and lamps, as the crowds pass through and salesman vie to attract attention and haggle over prices. Serious shoppers should be armed with a notebook, a calculator and time for tea and haggling when visiting the Grande Souk. when visiting the Souk several hours is the minimum for any shopping expedition. You can choose your vendor on your own or with a guide. Marrakech’s medina and its grande souk stocks the city’s treasure of handicrafts. If you’re willing to haggle then a deal can be had. If you are not a haggler then simply enjoy the spectacle and visit the Ensemble d’Artisansale, a craftsmen’s cooperative on the Avenue Mohammed V offers fixed price goods in a charming and unpressurised atmosphere. It’s also a good place to check out prices before plunging into the souk nd.you can also watch the craftsmen at work.Wander the timeless streets of the medina and be seduced by its ancient medieval mystique. The Medersa Ben Youssef was an Islamic college in Marrakech named after named after the Almoravid Sultan Ali ibn Youssef who reigned from 1106–1142. Wonder at the glory of the golden age of islamic architecture in the central courtyard and walk through the maze of 130 student cells in this Medieval centre of learning. La Maison de la Photographie is a photographic treasure trove of Morocco and Moroccans from the 1870’s to just before independence in 1956. to the gallery in a converted three floor foundak which houses a collection of photograhps of Morocco from the 1860’s and the very earliest days of photography to 1956 on the eve of Morocco’s independence. Over 5,000 photographs and glass prints of Morocco were brought from France to Marrakech by Patrick Man’ach and he and his assistants give a guided tour of this unique record of Morocco as it was.There is a video room with footage of Berber tribes dancing in the 1950’s At the end of the tour you can mount the terrace for a fine view of the Medina. Stay in a Riad in Marrakech’s medina and enjoy life in the ancient medina .Riad’s are individually richly decorated by local craftsmen and give you the opportunity to stay in an intimate atmosphere as an alternative to a hotel outside the Medina.. Many Riads offer cookery classes so that you can learn how to create your own Moroccan cuisine and riad owners can advise you where to go for local bargains in the souk. The Abdelsalem Park with its high palm trees, greenery and shrouded walks is one of these off the busy Avenue Mohammed V, it is a haven of much needed tranquility after a few hours of frenetic shopping in the souk . Other famous parks are the Aguedal and the Menara with its large water tank and famous Pavilion. The El Harti Park off the Place 16 November is a delightful park with a play area for children with two large stone dinasours. The famous exotic and colourful Majorelle gardens once owned by Yves St Laurent are on the Boulevard Zerktouni. The Bahia Palace was the 19 th century residence of the vizir Si moussa and his son who succeeded him, Ba Ahmed and has a remarkable maze of rooms and gardens there is even an ornate parade ground.The American novelist Edith Wharton stayed there in1917 when she was a guest of Marshal Lyautey after the First World War and it was te French army headquarters in Marrakech and she wrote a vivid description in her book “In Morocco”. Go back in time in a Vizir’s palace. Visit a Moroccan hammam to soak in the heat, be scrubbed and massaged with Argan, Orange and Rose oils to take away your aches and pains. Experience traditional beauty treatments of a gromage and sip tea by a delightful fountain. 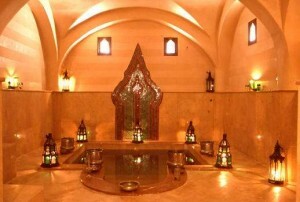 Marrakech has some of the most charming and authentic traditional Hammam’s in Morocco. Splurge on one superb Moroccan meal at Al Fassia restaurant on Boulevard Zerktouni in the Gueliz staffed by women it is still the place to sample the very best in Moroccan cuisine with a selection of salades and traditional tangines and couscous washed down with fine Moroccan wine.